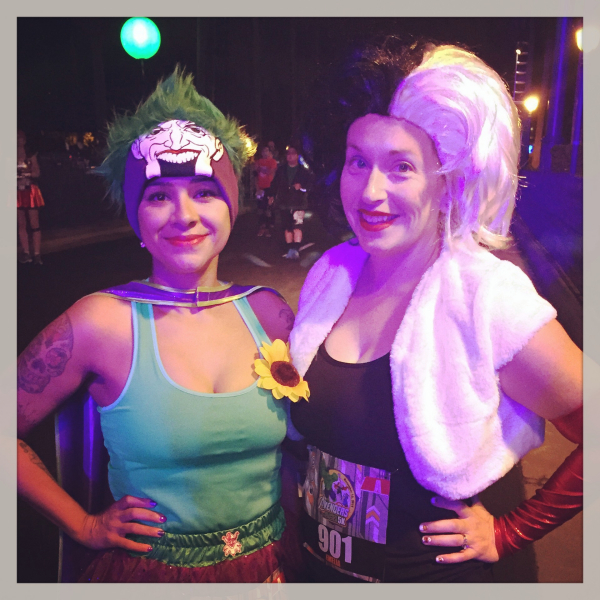 I may not have won the race, but when it came down to best costume - I am pretty sure I won the runDisney Avengers Super Heroes 5K! 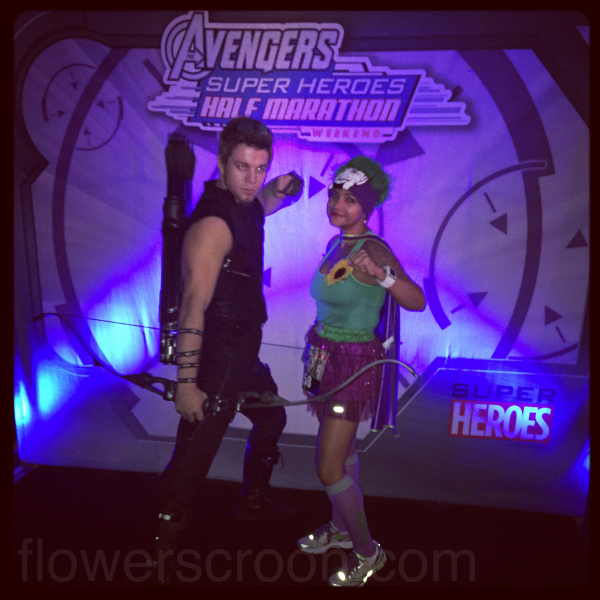 Leading up to the runDisney Avengers Super Heroes Weekend races in mid-November, I wrestled with the idea of wearing a race costume because it had become such a chore and such the norm to be costumed up. That gets boring - FAST. Then I remembered that I had bought a cape back in July specifically for this race, and just like that, my mind was made up. In a sea of Captain America and Thor costumes, I would be the lone Joker. The Joker and Cruella - villains till the end! On race morning I met my friend Emelia in our corral. 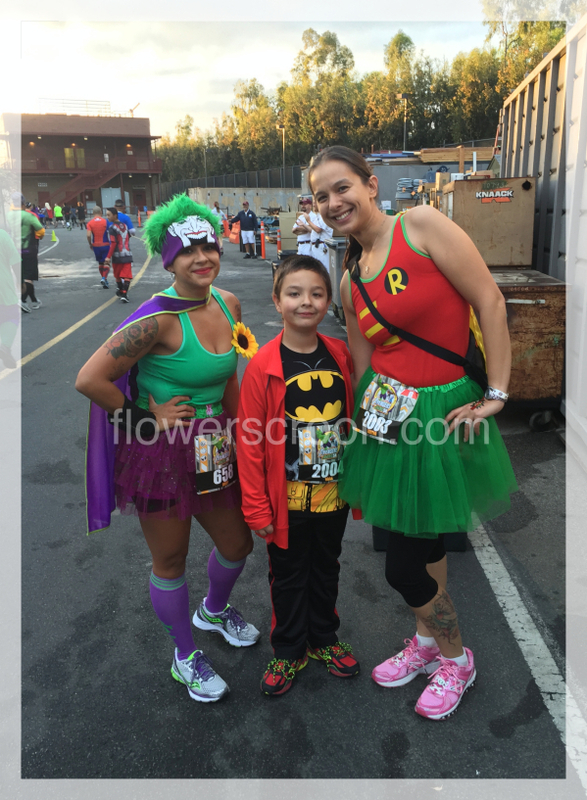 We snapped photos, joked about our costumes and looked forward to hitting the pavement for this inaugural race. Soon, we were off and ready to smash the first race of the weekend - the 5K. In the beginning it was cool enough to run while wearing The Joker beanie, but I was happy when I saw the first character stop. I already needed a break. There she was, for the first time at the Disneyland Resort, Black Widow. I continued running through California Adventure until I reached Condor Flats and discovered the 2nd character stop: Hawkeye. Yes, please! Not only was he super handsome, but he was super chatty and loved my costume. Immediately everyone felt our deep, romantic connection as he admired my costume and asked me questions. Magic happens, people. It really does. The Joker and Hawkeye. A match made in...somewhere. After that epic coolness, we exited California Adventure, crossed the esplanade and entered Disneyland. As I ran up Main St. U.S.A., I saw a really, really long line. The longest I had seen yet. I ran towards the front of the line to see who everyone was waiting for, and was a little surprised to see it was Mickey and Minnie. At this point I realized this line would officially set me back at least 10 minutes, but when would I ever have the opportunity to take a photo like this again? That is what makes these races so unique. So I ran back towards the end of the line and waited. A really long time. I'm happy I waited! I love this photo. After that, I ran towards the Matterhorn where Thor was waiting for me. No really, they actually shut down the line right after I got into it. I sent a text to my friend Emelia and she confirmed that she was already in Frontierland waiting in a line to meet Captain America, and that her line was also being closed. I waited in my line for Thor and decided I'd just have to wrap this race up because there probably wasn't anyone else left for me to meet. Now this is what I call a Magic Morning! After meeting Thor, I ran towards Fantasyland where there was a bit of a Mad Tea Party happening. I was stoked to see there were still some characters out! As you can tell from the sunlight, I had been on this course for a long time. The race started a little after 5:30am, and here I was still backstage and in the middle of a 5K. That was a really bizarre feeling. I kept running and stopped for photo with this awesome family of fellow DC Comics fans. I met Batman and Robin! 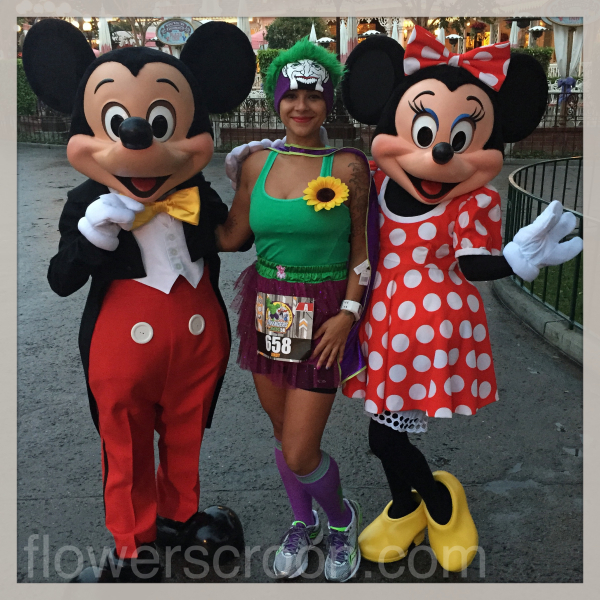 Finally, I was out of Disneyland and heading towards the finish line in Downtown Disney. That's when I saw my friend Tim who had long before finished the race. He's a total sweetheart - I was so glad to see him. After what felt like half of a day, I finally reached the finish line! I loved the race, but more than anything I loved that my costume was so unique! Race costumes may have become the norm, but I'm definitely far from conventional. The best part? 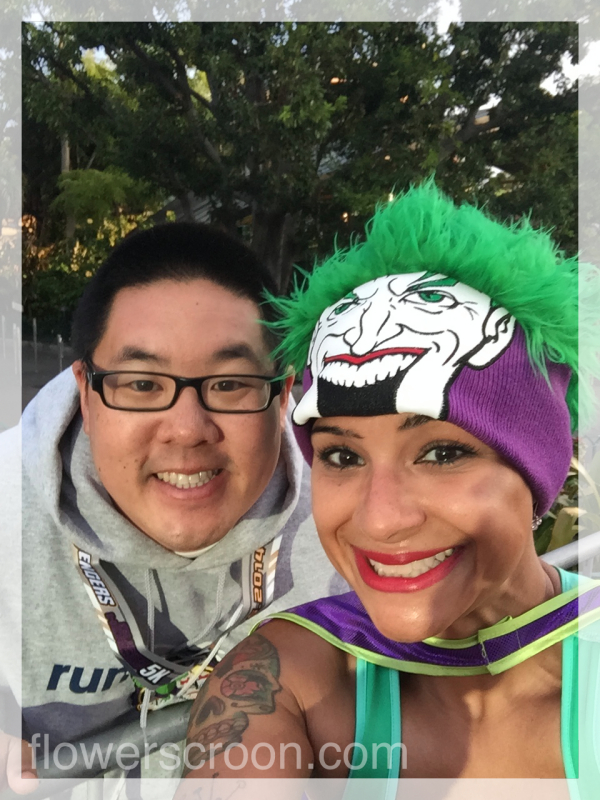 The Six Flags price tag was hanging off of the side of my Joker cape during the entire race. Ha! Going into this race I knew the crowd would mostly consist of non-runner Marvel fans, and I was prepared for long photo lines. But I did not even come close to imagining how soon characters would be taken off the course and exactly how long these lines would be. That said, I went into the half marathon with a totally different mind-set. Unless there was a whole new set of characters (there was a rumor we'd see the Hulk on course) I would not be stopping for photos. 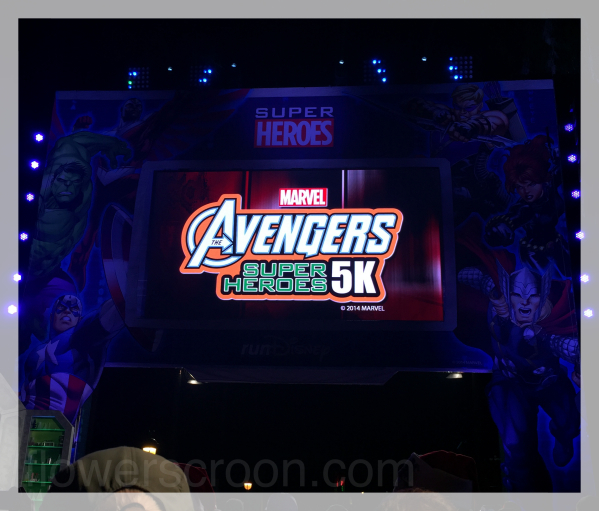 Little did I know that the wind would dictate everything about the runDisney Avengers Super Heroes Half Marathon...(check-out the recap here).